A 1 hour, uninterrupted session to gather a detailed health history and to establish goals for your course of treatment, followed by a thorough physical examination. A complete examination assesses all the factors that may contribute to your condition, which is essential in developing a holistic, integrated and individualized plan of care. We view our therapeutic relationship as a partnership where we aim to provide all the tools you will need to consolidate and progress the gains made in the clinic. The additional time that we schedule for your visit allows us to assure you are empowered to make maximal progress independently between sessions. Combining decades of professional training in exercise physiology with personal experience competing in and coaching a variety of sports, we are your ultimate training partners. During our initial consultation, we will gather a detailed health history and establish your performance goals, followed by a thorough physical examination. We will develop a personalized and multi-faceted training plan to help you fulfill your health, fitness and performance goals, whether those include running a 5k, competing in an ultramarathon, training for ski mountaineering or simply becoming a healthier, fitter version of your current self. Subsequent sessions can include a combination of hands on manual therapy, gait analysis, strength and conditioning, or facetime to discuss your condition and progress your plan. Call or email for further details and to discuss a package that meets your needs! Please call or email for further details! a culture of health & wellness in the same community we choose to live, work and play. Sarah earned her Bachelor’s degree from the University of New Hampshire where she competed as a Division 1 nordic skier. She continued her education at the University of Colorado in Boulder where she studied Integrative Physiology with an emphasis on whole-body function and its applications to human health and wellness. Sarah’s passion for movement based treatment approaches to musculoskeletal and neurological dysfunction led her to Regis University’s Physical Therapy program–one of the leading Manual Therapy programs in the country. Sarah earned her Doctorate in Physical Therapy with highest honors while completing research on the effects of backwards walking treadmill training on hundreds of gait, balance and kinesiological variables for patients with Parkinson’s Disease. Sarah has been practicing Physical Therapy in Eagle County since 2013 and earned her Board Certification in Orthopedics in 2016. She specializes in conservative treatment of the degenerative spine and hip, chronic pain management, orthopedic post-operative rehabilitation and return to sport performance. 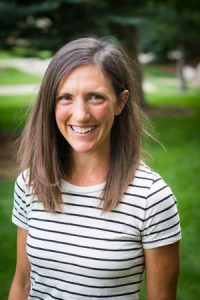 She is a professor of Human Anatomy and Physiology at Colorado Mountain College and guest lecturer for a variety of community wellness groups. Sarah is an avid runner, skier and mountain biker and has decades of experience working alongside elite and amateur athletes. In her free time you can find her playing in the mountains with her husband, Sylvan and baby boy, Ryder. Jennifer is comprehensively certified through Body Arts and Sciences International (BASI) Pilates and is a certified Bootybarre Instructor. Originally from the east coast, she first experienced the power of Pilates and discovered that the mindful movement and core strengthening of Pilates had the power to change her body and the way she carried herself in every-day life. Her clients are women and men of all ages, athletes, tri-athletes, post-rehab, and Pilates apprentices and teachers. Jennifer loves helping clients achieve their personal goals whether it involves aches and pain management, strength, improved ski season readiness, flexibility, weight goals or overall better health. Jennifer’s ability to see misalignments in the body (and continuing education specializing in anatomy & pathology) and address them through precise verbal and tactile cues is vital in helping clients understand the work in their body. Meticulous on form, Jennifer keeps her sessions fun and energetic. You can expect her to push and inspire you to make real changes in your own body and mind.